Do you want to build a snowman? 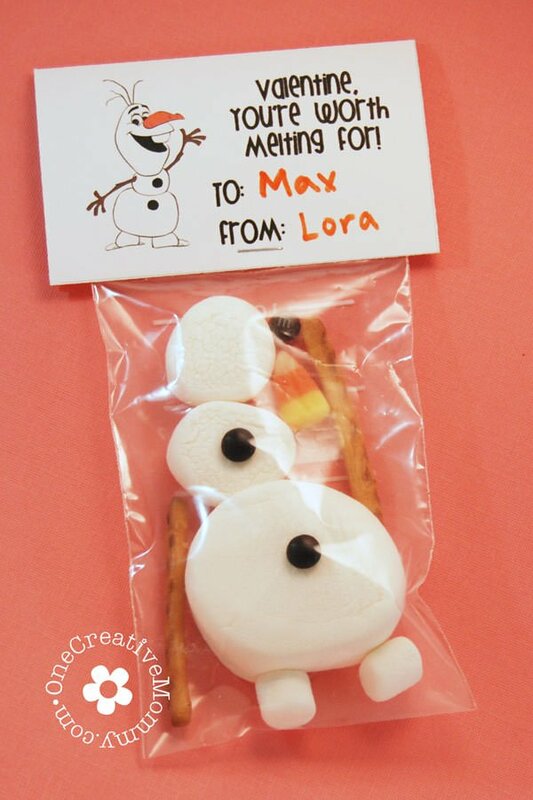 This adorable Olaf sock snowman was created for Lu’s Frozen birthday party. Each guest got to make her own, and the project was a huge hit. 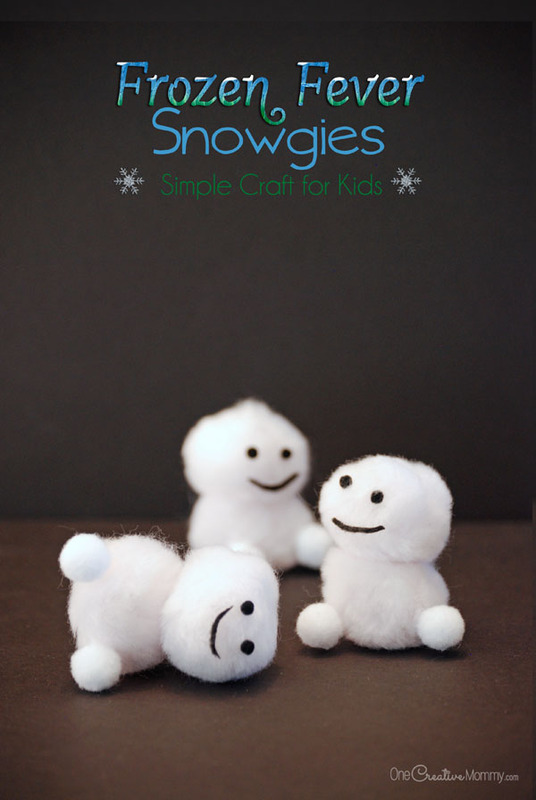 Want to learn how to make your own “Happy Snowman?” I’m super excited to share the tutorial and a free printable for the felt pieces. Here we go! You can adapt this tutorial for any size sock, but my measurements and printable are sized for Bobby Socks, kids size small, fits shoe sizes 5 1/2 to 8 1/2. You can use anything from a toddler sock to an adult sock, but I liked this size the best. Adhesive-backed black felt–one sheet of sticky-backed felt is enough for 12 snowmen. 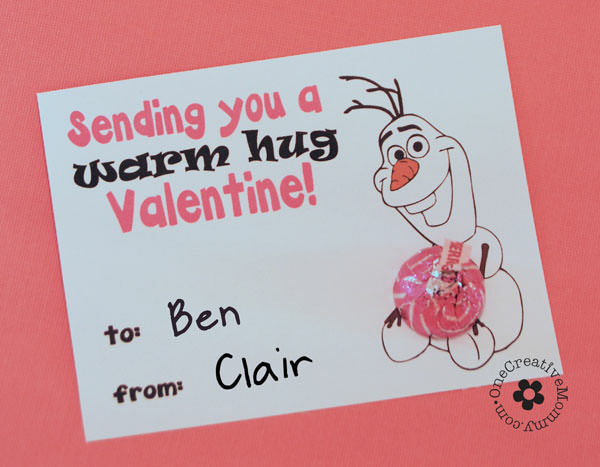 Free Olaf Features Printable. Click download link below to get the download. *Hint. When filling the sock with rice, you will need a helper. One person holds the sock open and the other pours the rice. Or, check out the video tutorial for an even easier way to fill up the socks that even little kids can do all by themselves. Pour just under 3/4 c rice into the bottom of the sock, and squeeze and shake it down until you have the shape you want for Olaf’s bottom. Make sure that the top of the sock is centered in the middle. Using a clear hair band, secure sock tightly just above the rice. Pour just over 1/8 c rice into sock, squeeze and shake down the rice, and secure with second clear hair band. Pour a little less than 1/2 c rice into the sock, , squeeze and shake down the rice. Shape the head so that it is taller than it is wide, and secure with third clear hair band. Starting where the middle section touches the bottom section, secure the ball with hot glue so that Olaf keeps his shape. Repeat where the head and middle ball touch. Glue the nose and eyes on with hot glue. Add the arms and feet (white pom poms). Poor Olaf. He’s missing his eyebrows! We didn’t even notice until we started making them at the birthday party. Actually, several of the kids decided to leave off the eyebrows, but I like them! For me, it’s not Olaf without the trademark eyebrows! Just look at all of these Happy Snowmen! I hope your family likes this project as much as we did. Special thanks to Sarah at Repeat Crafter Me for the Olaf idea. She created hers using tiny socks and poly fill. Check them out here. They’re adorable! Without her post, I would never have figured out how to give Olaf hair! Thanks so much, Hannah. What a nice compliment! Have a great weekend. This is adorable. My daughter went to a Frozen birthday party over the winter. She said it was the best party she ever went to! This would be great for a party decoration! Thanks, Daniele. The kids actually made these at the party and loved it! The snowman is adorable and I bet the Frozen birthday party was awesome! I have to pin this! Thanks so much, Alli. I know you’re quite the party planner, so that’s a great compliment! Very cute. My girls are going to love this. They are constantly singing the songs and acting out the movie. Thanks, Karen! I’m not sure who sings the songs more — me or my kids! Love it!! 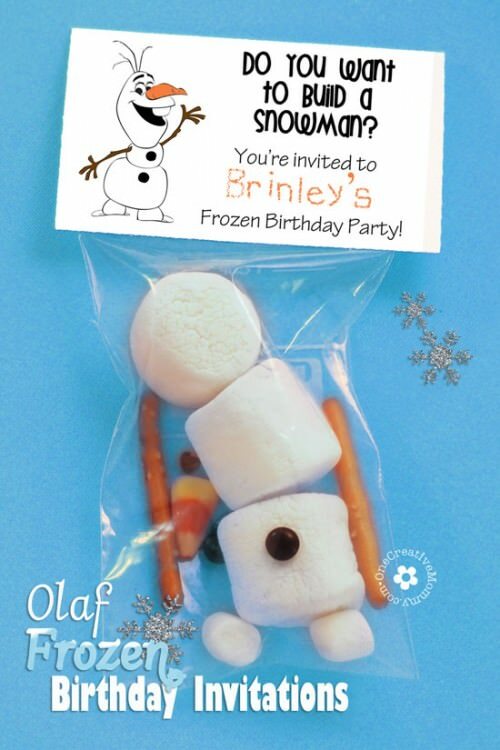 What a great idea for Frozen party!! Thanks, Annie. The kids really enjoyed it at the party. Thanks, Jenna! They were a lot of fun to make with the kids. Stopping by from Connections for Blog Growth “stumble upon”. How cute is this? Wish there were more ideas when we had our party. What a totally adorable craft! That would make a good winter decoration as well! Good idea, Jennifer. We have three of them at our house now! Thanks, Krystal! I love Olaf, too. 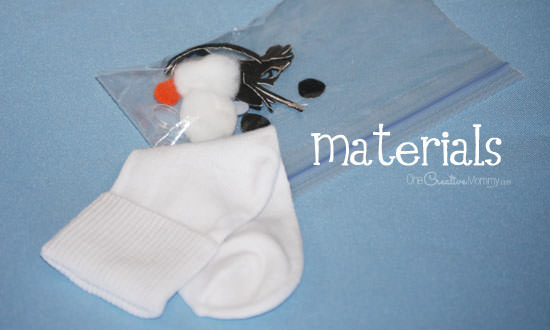 I have to admit, I am a little over Frozen, but I love the idea of making an Olaf out of a sock as a rainy day craft. Thank you! You’re welcome, Crystal. My kids are still loving Frozen, but I think I’ve finally seen it enough times! Oh he is adorable – and doesn’t look too difficult to make either. I have to get my kiddos hooked on Frozen so that we can use some of your ideas for a birthday party! Thanks, Clare! I just had to watch the movie once, and I was hooked! Love it! Can’t wait to try it with my girls, thanks! Thanks, Megan! I hope you and your girls have a lot of fun! Your post was the most-viewed at the Do Tell Tuesday party! Congrats! That’s so cool! Thanks, Lisa! Loved your olaf tutorial . Must try this with my daughter Thank you for sharing. Thanks so much, Sonia! I hope you have a lot of fun together! 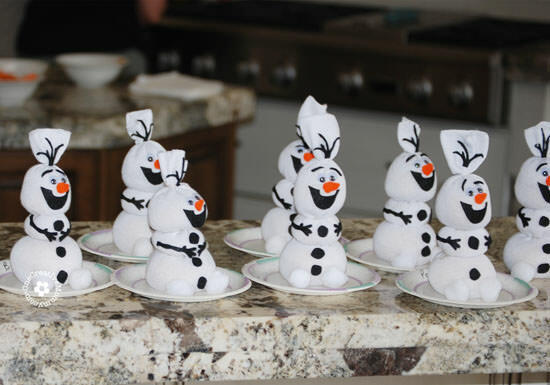 I am having a frozen birthday party for my daughter this coming weekend and are making these with kiddos! I’m excited for them. When printing the downloaded attachments, are what size should they be? Thanks for the awesome pin for these! Sorry I missed this, Crystal! I hope you figured it out. The printable is 8 1/2 x 11. I love Frozen, this sock Olaf is adorable! I am thinking of making one for my grandson…Thanks so much!!! Thanks so much! I hope your grandson likes it as much as my girls do. These are A-dorable!! What a great idea! Thank you for sharing!! Thanks, Cheryl, and you’re welcome. I hope you try it! Yes. There were four adults at the party. I think three of us helped with the project, and we used two glue guns. Thanks for your response! I’m having a terrible time finding socks that don’t have grey toes!! Where did you find yours?? Oh it like Target has them!! Yay! 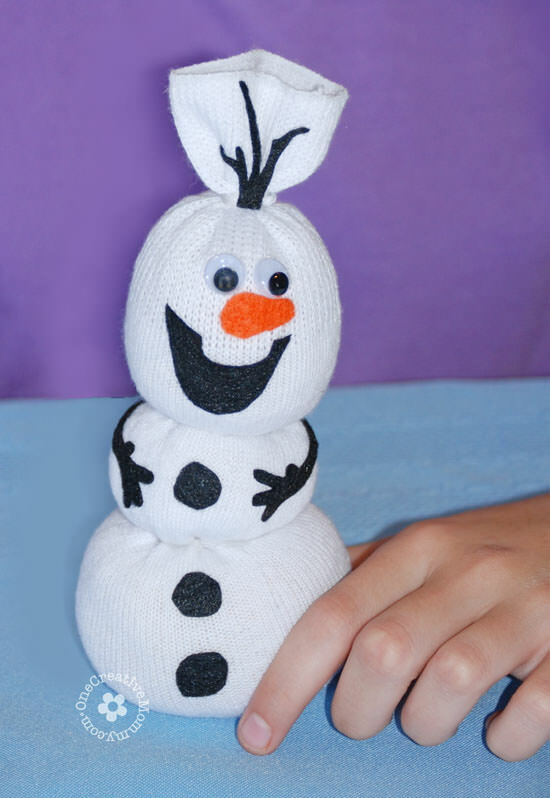 Olaf just has the cutest face ever and this is a really cute craft idea. 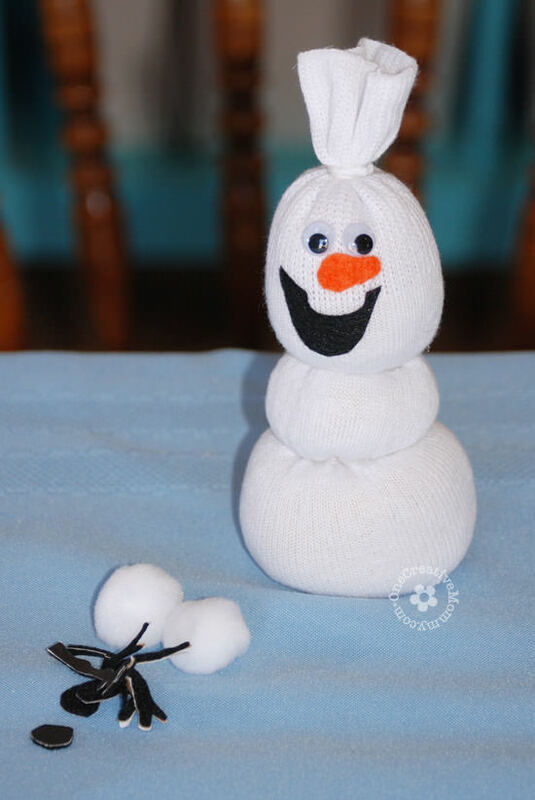 I plan on making a few Olaf crafts for the holidays Thanks for sharing! Thanks, Kristy. I hope you try it. My girls love theirs. Thanks so much for sharing, Lor! I just popped by and liked your page. Thanks for sharing the pattern. Love the size. Granddaughter is only three so I think I will use the fiberfill due to her age. She will love it. Thanks again. Thanks, Carol. I would just be sure that she is beyond the “putting things in her mouth”stage. The eyes would be a choking hazard. Have fun! Thanks so much for coming back and telling me about it, Zan! I love to hear when people use my ideas. It sounds like you had a lot of fun! This didn’t turn out well for me. I’m sorry to hear that, Maria. Is there a particular part that I can explain better so that others don’t have the same problem? Thank you for sharing…our kids love Olaf. We’ll be trying this one for sure this weekend! I’m so glad you like it, Linda. Have fun with your grandchildren! I came across this most adorable post on Pintrest a few days ago. We are having a Frozen-themed Winter Reading Club at our library, and Olaf is the perfect project to kick off our program! I can’t thank you enough for your extremely detailed instructions! The kids are going to LOVE this so much! Thank you for sharing this with all of us!! Have fun, Dolores! Make sure you have a few adults or older kids to help. Good question, Michelle. Don’t know why I didn’t think to put that in! The eyes came in a pack with many sizes, so I’m not sure the exact size. Using a ruler, they are about 1 cm in diameter. Hope that helps. Have fun! Wow!! My husband and I just hosted our first “Kids’ Christmas Craft Night” in Nicaragua. This was a “must-do” because our neighbor girls (4 and 5 years old) run around singing “Soy Libre” which is the translation for “Let it Go.” So I knew this craft had to be done. It’s not always easy to find crafting stuff here- but it all came together. Thanks again, great tutorial. If you want to see pictures shoot me an email, I’d love to share. I’d love to see pictures! I’ll send you a separate email. So exciting to know that my ideas are being shared all over the world! Love this! Thanks for sharing! I’m room mom for my son’s 2nd grade class and this would be perfect for his holiday party activity. So how did you got about all the felt pieces? Did you have to trace them and cut them all out? Was that pretty tedious? Thanks so much! Hi, Erica. There is a printable with this post for all the cutout pieces. Yes. I did cut them all out. I tried using my silhouette, but it wouldn’t cut the felt. It took some time, but it wasn’t too bad. Awesome and lovely. you give me a brilliant idea. Hi! Very nice tutoriel. I made these with my upper setion kindergarden class! 28 olafs!! The children loved to do them and it turned out to be a real success. To fill the socks with rice. I made a hole in the bottom of a plastic,picnic goblets, inserted it into the socks and made the kids fill the socks with the rice.. They were happy and proud to make thier snowman all by themselves. Thank you. 28 kids! Wow! Your filling idea is genius. Thanks so much for sharing it. I’ll add it into the post so that others can use it as well. Such a great idea. Thanks for letting me know! I love to hear when people enjoy my projects. I am hoping to do this for my daughter’s 4th grade class craft. I am thinking the hot glue gun would be too much for me and the teacher to do for 24 kids. Do you think fabric glue would work? Have fun, Lisa! (Check out the comment above yours for a great idea on how to fill the socks without making a mess. It’s from a teacher who did it with 28 kindergardeners!) I think fabric glue would be a better idea for school. That way you wouldn’t have the liability of a child getting burned accidentally. I’d love to hear how it goes. As for the glue I used fast sticking Glue that comes in tubes,when working with the children. I used hot glue after just to assure and give a better form. I think fabric glue can be a good idea too. Thanks, Grace! I’m still amazed that you tackled this with 28 kids at once! I did it with about ten kids and four adults. Such a fun idea. I plan to make craft kits for a local children’s hospital, Primary Childrens Hospital. I have been searching everywhere for a plain white bobby sock with no luck. The socks are always cute and colorful but not the basic white. Could you tell me where you found yours? Thanks! I’m so sorry I missed this, Cathy! I’ve gotten socks for this at the dollar store and walmart. I hope you were able to find something in time! These are adorable and I know they’ll be popular with my after school group. Heidi, have you or anyone else converted the printable into an .svg file that I can use on my Silhouette Cameo? I tried, but it would not cut felt. Oh my!!! This Olaf is super fun and cute!! I love that it’s super easy to make! 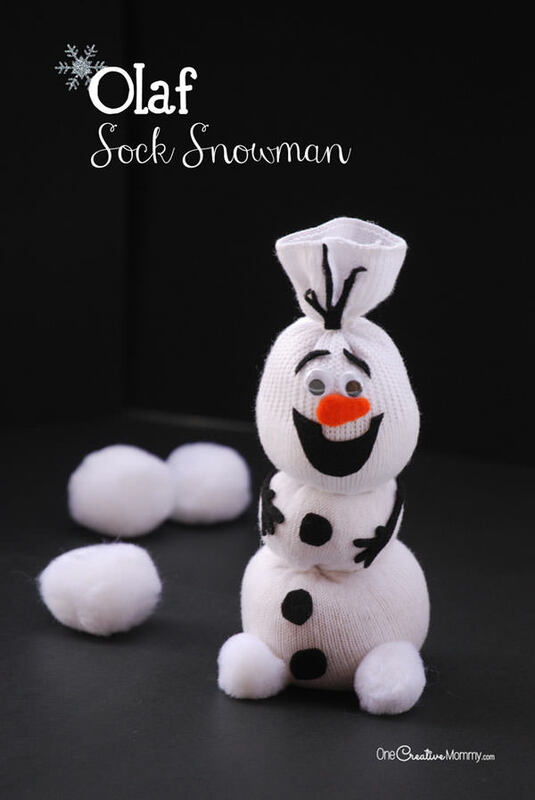 I featured it in my blog: http://www.plushiepatterns.com/olaf-sock-snowman-tutorial/ Thank you so much for sharing! The kids will definitely love this! Thanks so much, Becky. And thanks for the feature! Wow, so cute! I will make some for the kids. I’m sure they’re going to love this, they really love Olaf! It’s so simple to make. Hello there! love your Olaf tutorial! sooo easy, and fun! 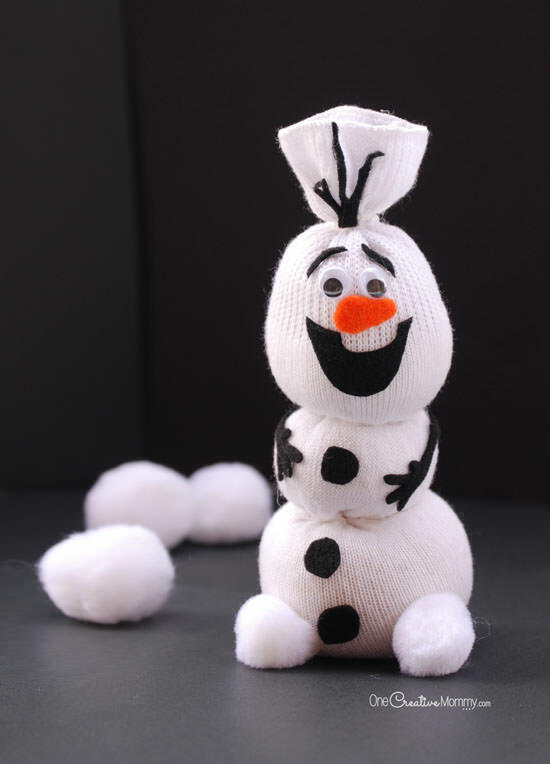 I featured it in my blog: http://www.plushiepatterns.com/olaf-sock-snowman-tutorial/ Thanks for sharing! love it! I just shared your adorable link on my blog http://www.realityofamommy.blogspot.com and can’t wait to try it!! Hello there! this is the best Olaf tutorial i’ve seen, thank for writing this interesting guide..
Its really awesome and creative too . Thank you. Awesome and lovely. A fun idea for me to try at home. You’re welcome, Kuldeep. Thanks for stopping by and taking the time to comment. Awesome post! Thanks for sharing really liked the tutorials…. You’re welcome. I’m glad you enjoyed the tutorial. Olaf is fun! Thanks, Adam. Isn’t it crazy how the love for all things Frozen and Olaf reappears each Christmas? Ha! I don’t have kids but I’ll be doing this craft myself! I’m also so excited you added the tiny fever snowmen, those are precious. Thanks, Sarah. I don’t know what I’ll do when my kids grow up and I can’t do kids’ crafts anymore. Wait for grandchildren, I guess! These ideas are AMAZING!! My kiddos are going to love them! Thanks, Brigette. I hope you and your kids have a great time! These are so cute!! I want to make one for my daughter. Have fun, Jacqui. There’s just something about Olaf, don’t you think? This is so fun! My daughter would love to make Olaf. Thanks, Amber. You and your daughter should try it! It’s not hard. This is such a great DIY idea!! I am definitely going to make one with my niece next week! Love This. Kids will love it. aww these are so cute! I remember making something like this when I was a kid! Thanks, Mihaela. I’ve made a lot of sock snowmen in my time, too. Oh gosh! He’s adorable! What a great tutorial! Thanks, Angela. He was a lot of fun to make with my kids. Aw this is super cute! I love it! Thanks, Amanda! There’s just something about Olaf. I wonder how long kids will still be in love with him. These little faces are so cute! They do really remind me of Olaf! Thanks, Chloe. I think the faces are the key to making something look like Olaf. This is so adorable and an easy tutorial! Thanks, Isaly. I’m glad I finally added a video tutorial to this post. I think it helps a lot. You have such cute tutorials on your site. I think my girls would love to make a Olaf Sock Snowman! I will be saving this, thank you! Thanks, Wren. I really appreciate the compliment. Have a great Christmas! Wow, this is so fun and easy. It’s great for kids party and even teach them how to make it their own. Thanks, Cristina. We made ours at a birthday party, and they were a big success. What a cute idea! This is unique and easy to make! Kids will surely love it. Thanks, My Teen Guide. It sure was a lot of fun to make. Thanks, Elizabeth. The Frozen phase seems to resurface around here at Christmas time (at least the Olaf part). Very nice idea for a Frozen themed party or winter activities at home!! Thanks for sharing! Thanks, Jackie. We’re always looking for fun winter activities once it gets too cold to play outside. Thanks, Katrina. It’s a really fun project. You’d definitely be the fun aunt if you did this with your niece. Wow! 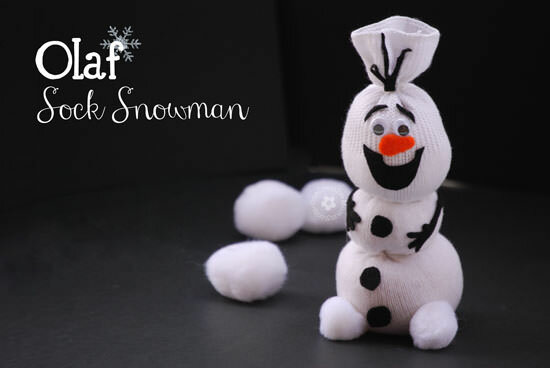 Bear is so smart I love the Olaf sock snowman tutorial it looks fantastic! Thanks, Ana. Bear was a good helper for this project. This is so stinkin’ cute. And what better way to use those orphaned socks. That has to be one of the cutest craft ideas I’ve ever seen. Great idea for elementary school teachers. Aw, thanks, Jill! Several elementary school teachers have used this craft in their classrooms and told me it was a success. I’ve only used it at home for birthday parties. Oh my gosh! This DIY tutorial looks amazing. I can’t wait to do it with my kid. Such a great idea. Thanks! Thanks, Sharon. I hope you have a great time making Olaf at your house! Oh my goodness. Great great job. Love this craft. Thanks, Michelle. It was a lot of fun. I’m glad you like it. Merry Christmas! Aww! What an adorable arts and crafts idea! I’m sure this will make a lot of kids happy over the season! It would be an awesome decor or a nice gift to the kids! It’s definitely worth the effort! Thanks so much, Elizabeth! It was a lot of fun. We use Olaf as a craft and decor for sure. These must’ve been so fun to make! They’re so cute as well! Thanks, Sondra. He was so fun to make that we have about five at our house! These are so cute! My kids would love to make something like this. Thanks, TColeman! You should try it with your kids. These are the cutest! I’ve never made arts and crafts like this before, it’s awesome! I would love to give this away to kids especially those who aren’t really fortunate enough to celebrate Christmas. Thanks, Carol. What a nice thought. I’m sure any kids would love to receive a sock Olaf. My girls sleep with theirs. Great idea for elementary school teachers. 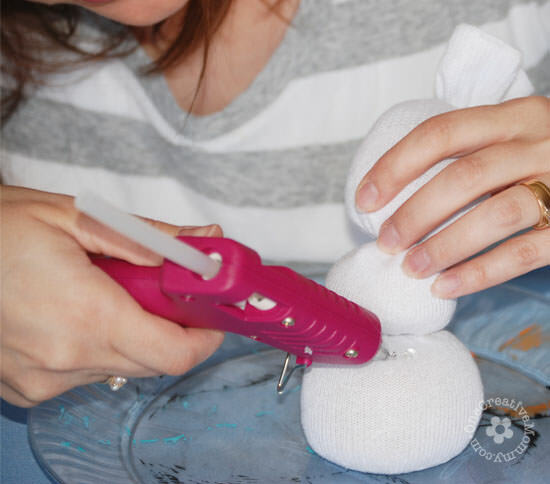 This Olaf Sock Snowman Tutorial looks so easy to do. Kids will love this. A decor that will remind you of the winter time in any season. Very beautiful. Wow I Really loved these snowman ideas. Frozen is favorite movie of my Kids. You’re welcome, Joelle. I hope you and Lou enjoy making the Olaf Sock Snowman. Thanks, Sanjana. You and your kids should try this activity out. It’s really fun. i really love your content cheers to this awesome tutorial..!! the way you explaied this tutorial is superb keep it up i just love reading this type of content. 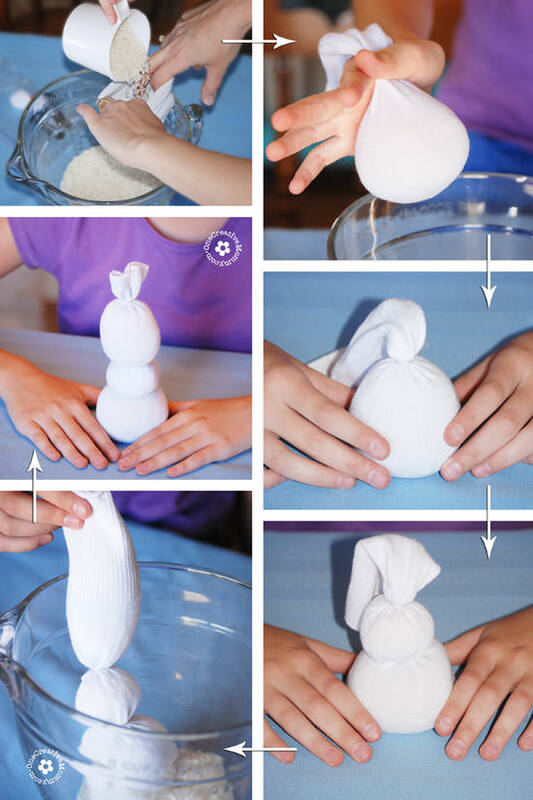 it’s very nice thought to make Olaf Sock Snowman For children learn.